In 1929 archaeologists from the British and Pennsylvania Museums, led by Sir Leonard Woolley, discovered an amazing find in old graves in the city of Ur during excavations between Baghdad and Basra in Iraq. It appeared that these were royal graves from 2600 BC, and that what was uncovered was the poignant scene of a mass suicide. Many bodies lay, as if asleep, dressed in similar costumes, with identical jewelry. In a corner of the graves lay a pile of very deteriorated musical instruments, including three lyres and a harp. These instruments, or what remained of them, were restored and distributed between the museums that took part in the digs. The finest of them was given to the Iraqi National Museum in Baghdad and is called the Golden Lyre of Ur. In April 2003, it was one of many objects damaged by looters at the museum in Baghdad. This lyre was the earliest stringed instrument ever found, and its destruction, along with the vision of the players dying alongside their instruments, struck a chord in the mind of Mr Andy Lowings. As a harp player himself, he felt that making a playable version of the Golden Lyre could help to build bridges between modern Western countries and Iraq, and bring fresh insights into ancient Sumerian culture for a new generation. Andy spearheaded an effort to create an authentic reconstruction of the lyre. To do this, he coordinated a large international team of volunteers: craftsmen, donors, technicians, musicians and supporters. After several years of work, the reconstruction of the Golden Lyre is now finally finished, using the same materials for decoration found on the original instrument, including gold, lapis lazuli, limestone, shell and silver. Surely the most noticeable feature is the large bearded bull's head at the front, which was made -- like the original -- of gold. 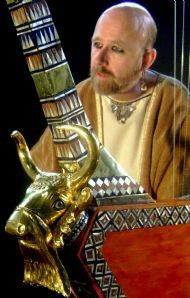 Whilst no Sumerian music survives, Bill approaches playing the lyre similarly to the way he examines medieval music, by letting the instrument teach him. 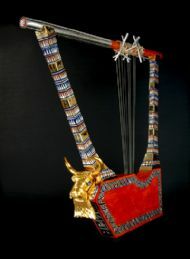 The long gut strings of the lyre buzz in a satisfying growl, which evokes the sound of the European renaissance bray harp, and which also echos the sound of the traditional Ethiopian buzzing lyre, the begena. This validates ancient descriptions of of the lyre sounding like a "softly l owing bull". The buzzing on both instruments is due to the strings gently touching the top edge of the table-like bridge. 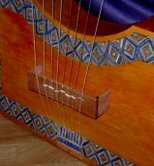 On the begena, the angle of the strings is regulated by thick leather strips, which wrap around each string (R). On the lyre, the strings are elevated by moveable wooden wedges (L). Dr Anne Kilmer has identified on a cuneiform tablet from Nippur the names and number of strings for lyres, and the arrangement and relationships of the strings. This provides us with evidence to deduce a tuning scheme which yields an 8-note diatonic scale. Pitches are able to be raise d and lowered by a semi-tone to create modal sequences. Bill Taylor is one of several musicians invited to perform on this valuable and important instrument. Proposing that the lyre originally accompanied the voice, he works with reader Jennifer Sturdy to present costumed performances of Mesopotamian poetry. They have recently appeared in Berlin (Sept. 2006) and Brussels (March 2008), and are once again invited to give a concert in Berlin in Sept. 2008. They can be seen in a YouTube video, made by Mark Harmer, performing Shiduri's advice to Gilgamesh. A CD is soon to be released (winter 2008-09) featuring Bill & Jennifer's arrangements with the lyre. Bill also accompanies historical piper Barnaby Brown, who plays a replica set of the silver double pipes from Ur. They have also made a YouTube video with Mr Harmer, performing an original composition by Barnaby.